We were looking at the new Facebook Marketplace for last week's Finance Fridays. 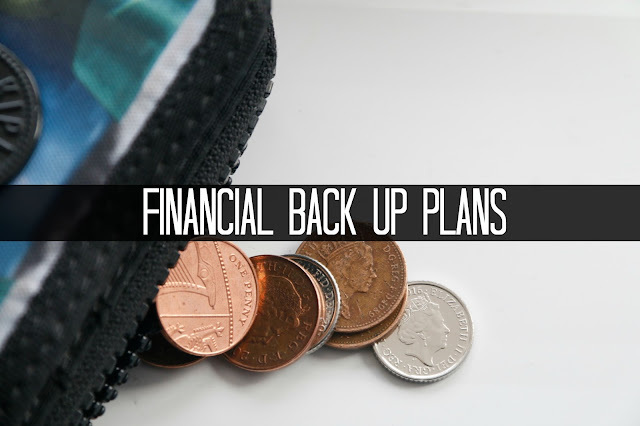 This week we are talking about what financial back up plans people should have in place. A recent study by Shelter has found that one in three working families in England could not afford to pay their rent or mortgage for more than a month if they lost their job. This followed a government report that showed that 16.5 million people have no savings. One of the first things I learnt when I was studying to be a financial adviser was to try and have at least three month's salary saved up. It may seem a lot of money to put away just for a rainy day but it could be an amount that would mean you could keep your home. You could lose your job for a variety of reasons – illness, redundancy, business failure or sacked without notice. If any of these things happen to you make sure you have a back up plan. Income protection plans – these are an insurance plan that you pay premiums to and then pay out if you lose your salary. They've had a bad press due to the PPI mis-selling scandal where policies were sold to people who weren't eligible to claim on them or were deemed bad value. Do be aware that most policies won't pay out if you are sacked or walk out of your job – they are designed primarily for cases of illness or redundancy. You can chose a deferment period before the policy starts paying out. Some policies will pay out after six weeks and go up to six months. The shorter the deferment period the higher the premium will be. There will also be a maximum period that they will pay out for. Savings account – Interest rates are terrible at the moment but have an account with at least a month's salary in which you can access instantly. Think about having another account with another two month's salary in which has a notice period to withdraw your funds. These accounts should pay a slightly higher amount of interest but will stop you dipping into them. Over pay your mortgage – If you need to take a mortgage payment holiday your mortgage provider will be much more willing to allow this if you are ahead with your payments already. Get a job – It sounds easy doesn't it? If you haven't got a job then try to get any job that will at least tide you over for a bit until you find something better. Don't tie into long contracts – Most telephone, broadband and TV contracts are for a minimum term of at least 12 months. If you need to cancel them if you find you can't afford to pay for them you will probably find the cancellation fee is the same as paying remainder of the contract. If possible try to keep to rolling contracts which you can get out of easily. I found that companies keep ringing to persuade us to take up new contracts over the phone but we won't agree to it – a very sneaky tactic. Have you got any financial back up plans? Would you be able to pay your bills if you lost your job? If you want to join in with this week's Finance Fridays then add your link to the linky below. Any post concerning financial matters is allowed. Full details here. It doesn't have to be published today as you have until 23.55 on Tuesday 1st November 2016 to join in. Great advice. We already have a savings account and are slightly overpaying our mortgage each month.